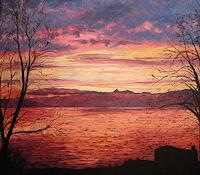 If you are interested in the work "Sunrise over lake Geneva" please fill out the form below. The picture is characterized by strong colour and bold strokes on a black background playing with light and shadow. Only a palette knife is used in the creation of these paintings.The price includes the shipping to abroad. This lovely view happened to me at 7am when I woke up in the little hotel next to Geneva lake.